Horsepower is highly addictive. As automotive enthusiasts, we crave it insatiably. Each time we place ourselves behind the wheel of a vehicle, a brief moment arrives when we wish for just a little more potency. Whether driving a 138-horsepower Kia Rio or a 638-horsepower Chevrolet Corvette ZR1, there is always an instant when the initial rush begins to slow and we ache for just a little bit more. But what if it were possible to have too much power? What if there were a vehicle that satisfied our desire so completely, to the point where we were overwhelmed (think along the lines of sweet-tooth Augustus Gloop swimming in Willy Wonka’s river of chocolate)? Would we finally stop thirsting for more? 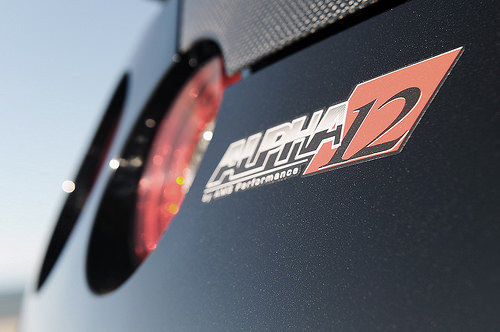 To solve the riddle, we tracked down the fiendish Alpha 12 GT-R by AMS Performance. It is not just the quickest accelerating street-legal car that Autoblog has ever driven. With a quarter-mile time of 8.975 seconds at 169.49 miles per hour, it is likely the quickest street-legal volume-produced tuner vehicle on the planet. Founded in early 2001, AMS Performance is no stranger to horsepower. One of the company’s first projects was tweaking Ford’s turbocharged 2.3-liter under the hood of the (under-appreciated) Merkur XR4Ti. It wasn’t long before the team, led by Martin Musial, began tooling on more capable cars like the Mitsubishi Evolution VIII and Nissan 240SX. By 2007, the company had moved to a facility in West Chicago and its competition-only AMS drag car had captured the title as the "World’s Quickest Evo VIII." In 2009, AMS expanded its portfolio and began to focus on a wider variety of sports cars from Porsche, BMW, Hyundai and Nissan. Then the Alpha 12 was developed – it is, in three simple words, Godzilla on crack. But it was the Nissan GT-R (aka "Godzilla") that really captured the company’s attention. Despite being blazingly fast right off the showroom floor, AMS developed and refined the car to deliver even quicker acceleration. World records fell as its Alpha 6, Alpha 9 and Alpha 10 models devoured the competition at drag strips and on racing circuits. But then the Alpha 12 was developed – it is, in three simple words, Godzilla on crack. Transforming a GT-R into an Alpha 12 is involved. After customers supply AMS with a donor R35 GT-R (new or used), the stock powertrain is surgically pulled and the metamorphosis begins. The OEM 3.8-liter VR38DETT V6 block is bored out to 4.0-liters of displacement, reinforced, and then fitted with an AMS Alpha CNC race ported cylinder head with AMS custom camshafts, AMS injectors, AMS MAP sensors and more. The stock turbochargers are ditched and replaced with an AMS Alpha 12 Turbo Kit, and an AMS intercooler and pipes are installed to reduce the charge temperature. The entire exhaust, from downpipes to the muffler, is then replaced with high-flow componentry. Lastly, the stock gearbox is upgraded with PPG and Dodson components and the differential is fitted with a high capacity oil cooler. What finally emerges is a balanced and blueprinted AMS Alpha 4.0L Race Engine. Locate a dynamometer that can handle it and the Alpha 12 will show you 1,100 horsepower and 900 pound-feet of torque on 93 octane unleaded. Pump in some racing fuel, and those numbers rise to 1,500 horsepower and 1,050 pound-feet of torque. The figures are dizzying, but they speak for themselves. The 0-60 sprint takes 2.4 seconds. More spectacular is the acceleration from 60-130 mph. The Alpha 12 does it in just 3.31 seconds. In the aforementioned quarter mile, a range-topping Bugatti Veyron 16.4 Super Sport (almost a second slower in the benchmark) would be left choking on its dust. Locate a dynamometer that can handle it and the Alpha 12 will show you 1,100 hp and 900 lb-ft of torque on 93 octane unleaded. Understandably, a car like this needs some serious real estate to run. Wide open asphalt in places like Texas, Nevada or the deserts of California come to mind. But sadly, we are sitting behind the wheel of the record-breaking jet black Alpha 12 in congested Santa Monica, California. To make lemonade out of our rather sour situation, our goal is to drive the modified GT-R north, up famed Pacific Coast Highway, to escape the bulk of the stop-and-go beach traffic. While we won’t be cracking triple-digits, we should be able to get a good sense of what this thing is all about. We met the Alpha 12 in a dimly lit concrete parking structure under a Santa Monica hotel. To its credit, and despite all of the carbon-fiber add-ons, the black Nissan GT-R appears both tasteful and clean. Even compared to the other tame passenger vehicles in the garage, it didn’t appear ostentatious. After a splash of (racing?) fuel from a handy five-gallon container, I climbed into the driver’s seat.. Sitting to my right was Ivan Phipps, Special Projects Technician at AMS. Seriously multitalented, Ivan is as skilled with a wrench as he is behind the steering wheel, which made him the ideal co-pilot (Ivan was in the driver’s seat of the Alpha 12 for its record-setting quarter-mile run, and in another video losing control – and recovering – at over 200 mph). Everything, including the automatic climate control, still works as it did from the factory. Following the tone set by the exterior, the cabin of the Alpha 12 will appear virtually stock unless the customer orders extras such as race bucket seats, harnesses or a roll cage. In fact, with the exception of some of the non-working telemetry on the center stack computer (some of the sensors are confused by the modified fuel injection and new engine mapping), everything, including the automatic climate control, still works as it did from the factory. Furthermore, and serving as a testament to its streetability, all functional controls work exactly as they do on a stock GT-R.
With a press of the ‘start’ button, the freely breathing 4.0-liter V6 barked to life and sent a concussion wave bouncing off the walls of the parking garage. Idle was smooth, but the raspy and aggressive exhaust note coming out of the enlarged tailpipes was delivering clues that everything wasn’t normal. The Alpha 12 will operate in full automatic mode just like any stock GT-R, but Ivan explained up front that he preferred to shift the dual-clutch gearbox manually with the steering wheel-mounted paddles. Ignoring his suggestion, I left everything in automatic mode and pulled out of the parking garage. I had covered no more than a quarter mile when Ivan’s comment immediately made sense. The heavily modified gearbox, designed to handle upwards of 1,000 pounds-feet of torque, was brutally deliberate in its fully automatic engagement – uncomfortably so. After a few minutes of taking the abuse, I heeded my passenger’s advice and began to shift manually with the column-mounted paddles. There was more too it, though, as the manual-mode shifts still felt as if we were being rear-ended by a 40-ton anvil with each gear change. After some experimentation, I discovered the trick to driving the Alpha 12 smoothly. By lifting off the accelerator slightly between shifts (just like you would do when clutching with a manual gearbox), engagement of the next gear was smooth. Don’t get the impression that an Alpha 12 is a docile pussycat. Its mannerisms are much harsher than a stock GT-R.
Don’t get the impression that an Alpha 12 is a docile pussycat. In fact, its mannerisms are much harsher than a stock GT-R. To handle its outrageous output, AMS has fitted some seriously heavy-duty components. Most are buried within, but some (like the high-volume free-flow exhaust and the differential oil pump with straight-cut gears) operate much louder than stock mechanicals. To a true gearhead, one who can identify the din, the sound is oddly reassuring. As AMS has left the stock Brembo brakes and multi-mode electrically adjustable damping suspension in place (no need to add unnecessary complexity), the ride remains every bit as compliant and comfortable as a stock GT-R. For street use and occasional drag racing this is probably just fine, but I would upgrade the brake pads at minimum if road-racing track duty is on the agenda.